Beautyworld MIDDLE EAST 2018 was held at Dubai World Trade Centre for 3 days from May 8-10. There were 1,736 exhibitors from 62 countries – the largest number of exhibitors in the past 20 years. 60,000 people visited the event from all over the world. NS Trading visited Beautyworld together with the CEO of ALLIE International, Inc. from Japan who was interested in learning about new products in the diet, beauty & anti-aging, and wellness categories. This year, there was also a special JAPAN PAVILION where 12 Japanese companies introduced their innovative and high-quality products. 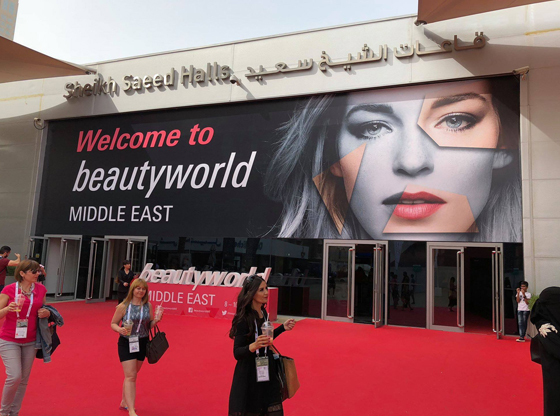 Beautyworld MIDDLE EAST 2019 will be held on April 15-17, 2019. Please do not hesitate to contact us if you are thinking of exhibiting or simply visiting Beautyworld next year and need any help with anything related.